Many people think of Las Vegas as the ultimate party town, and rightfully so. But whenever you visit Las Vegas, you’ll also see lots of families with kids walking down the Strip and checking out the local attractions. This is because many parts of Vegas are also very family-friendly, especially during the daytime, with lots of fun options to keep kids of all ages entertained. So, after you and your little ones are done exploring the theme parks, botanical gardens, amusement rides, aquariums, and live performances for the day, plan to stay at one of these top hotels in Las Vegas for families. The Circus Circus hotel is loads of fun for kids and sure to keep little ones entertained right on site for your family trip to Vegas. Part of this hotel has a huge carnival area to play games and win prizes, such as stuffed animals. It’s also fun for adults to embrace their carefree side and feel like a kid again, perhaps getting competitive while playing the games here. It’s also fun to watch the circus act performances that occur here throughout the day, which are totally free and family friendly. One of the classic performances at the Excalibur is the Tournament of Kings show, which is a dinner show that takes you back to Medieval times. Kids love the castle theme of this Vegas hotel and its festive décor both outside and in. There’s also a great arcade here, multiple pools on site with a waterslide, and prize redemption game that provide instant souvenirs for little travelers. The Excalibur is also a more budget-friendly option for families looking to stay on the Strip. Mandalay Bay is also a fun place to stay with your family in Vegas because of the Shark Reef Aquarium. Here your little ones will enjoy watching sharks, turtles, crocodiles, stingrays, and other sea creatures. There’s a huge pool here that welcomes kids and has a lazy river and wave pool to enjoy. Mandalay Bay Beach even has real sand sink your toes into. You can also watch live performances that are suitable for all ages here, such as concerts and The Lion King. We also like the MGM Grand Hotel for a family-friendly hotel option in Vegas, especially because of the impressive pool complex. Kids love the pools here, and the on-site Rainforest Café is always a big hit with families too. Look for discount packages so that your family can choose between multiple adventures, including the CSI experience at MGM Grand and the Adventuredome at Circus Circus. The Golden Nugget is always a favorite spot among families in Vegas because of the tank pool with real sharks inside. There’s an arcade inside the hotel for kids to enjoy and also kid-friendly food options, such as pizza and hot dogs. The Golden Nugget isn’t on the Strip, but it is on Freemont Street, which is another really fun place to spend your family vacation in Vegas. The Mirage is also a kid-friendly Vegas hotel with a volcano outside that erupts nightly. This tropical-themed hotel even has a soundtrack and grand finale to go with its eruption show. Kids also love the dolphin habitat here to see swimming creatures under water. The Mirage has a 20,000-gallon saltwater aquarium that is fun to check out. Compared to many of the other live entertainment options on the Strip, many Cirque du Soleil shows are family-friendly and really impressive for both kids and adults. For dining options, parents can find kid-friendly foods at the onsite deli and California Pizza Kitchen. No trip to Vegas would be complete without a family ride on the famous gondolas at the Venetian. After your ride, enjoy some Italian gelato with your kids as you walk along the interior paths that make you feel like you’re in Europe. For live entertainment, this is a great place to see a concert by bands like Chicago, Earth Wind and Fire, and ZZ Top. One of the best things about the New York New York hotel is the rollercoaster that launches from the hotel lobby and speeds all around the exterior of the hotel. This rollercoaster features a 180-degree heartline twist-and-dive maneuver and thrills over 1.4 million riders each year. Teenagers staying here can participate in the Big Apple Coaster Virtual Reality Experience and chase aliens above the Vegas strip! There’s also a large arcade inside this hotel, and it’s fun to walk through the New York City-style neighborhoods inside as well. The Luxor offers a more budget-friendly place to stay on the Strip than many other Vegas hotels, which is a big plus for families. Kids enjoy the exotic Egyptian pyramid décor of this hotel, as well as the museums inside and the Blue Man Group shows. These shows are high-energy and family-friendly, welcoming kids even as young as three years old. Consider staying at one of the rooms in the pyramid for interesting views and perhaps even a corner suite for a little more space to spread out with a living room area. 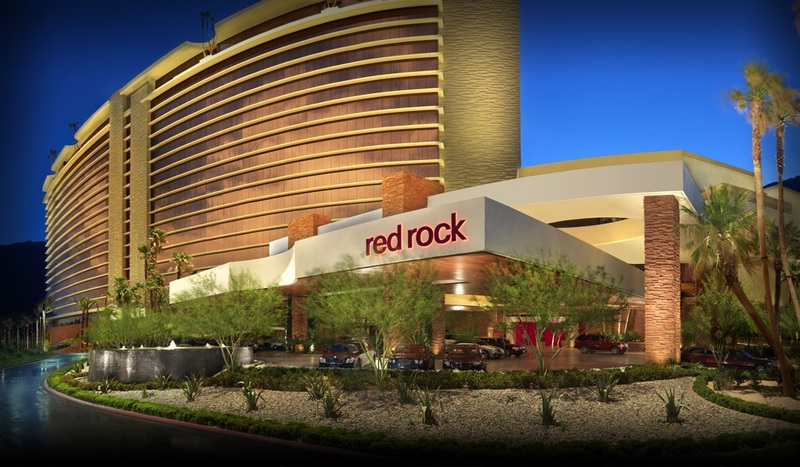 If you want to visit Vegas but be off the Strip, then the Red Rock Casino, Resort & Spa is a great option for families. You’ll be about a half hour from the bright lights of Vegas but still have lots of things to do on site. For example, there’s a movie theater, bowling alley, and wading pool at the Red Rock. If parents want to go out to gamble or have a few drinks, the hotel also offers babysitting services and a kids’ club. There’s also a Kids Quest play structure here, a large arcade, and you’ll be in close proximity to Red Rock Canyon for outdoor hiking adventures with your kids.